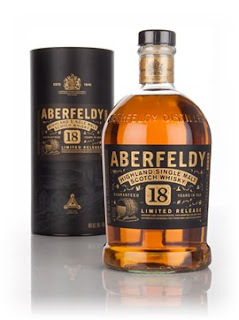 Aberfeldy is a malt I'd heard of but never really tried. Mainly because I didn't want to fork out money on the low abv and it can be quite obscure. I had a bottle bought for me for Christmas though, so let's see how it tastes. 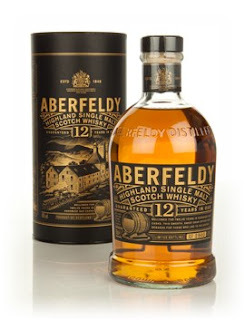 Nose: Heather, honey, a little floral, some heathery smoke, wood smoke, green oak, some lemon, a little vanilla and toffee. More lemon after a bit. Water: A drop (Not going full Ralfy-Mode) reveals more smoke, ashes, beeswax and orchard fruit. Taste: Sweet arrival, toffee, going quite juicy with pear, then lemon, fizzy lemon sherbet, developing some harsh sappy oak. Soot and oak into the finish. Water: More gentle arrival then more smoke with ashes. Finish: Short/Medium length. Harsh oak and chocolate and a little lemon. Notes: Batch 2905. Shame about the harsh oak, but still very quaffable. Not as good as the 18yo but more smoke. Finished my bottle in a week, which is very unusual for me. Would normally take my a month. Nose: Heather, honey, rich sweet sherry, sweet fruit- Apple, vanilla, quite cakey. Taste: Quite rich, heather, honey, some vanilla, fruity sherry, cherry, cherry chocolate. Finish: Medium length. Cherry chocolate (the natural dark stuff) and a touch of smoke. Notes: Less smoke than the 12yo but more complex. Pleasant, gentle, nice complexity and fullness for 40%.